Jordan "Bobby loved you from the beginning. Did you have feelings for him?" Ash "No, he's like a brother." 12:10pm Out in the hot tub room – Johnny, Willow, Pilar, Ash, Brittnee, Bruno, Sarah, Bobby and Zach. They’re talking about house boats and other random things. Willow talks about the live feeds and says when you watch then you understand the alliances way better. She says that some blogs break it all down and say what happened at what time and then post videos on youtube. Meanwhile inside the backyard – Jordan and Kevin are telling each other their past sports stories. 12:35pm Jordan says right away Bobby loved you from the beginning. Did you ever have any feelings for him? Ash says no, he’s like a brother. They head inside. Ashleigh doesn’t think he can pick her up. He picks her up and carries her to the couch. She says you can pick me up .. you’re a little out of breath but did it. He sits down on the nomination chair. She tell him he should never sit in the nomination chair. It’s bad luck. Jordan says I’m not scared of it. Ash says you should never get comfortable. Jordan says I’m not comfortable, that’s why I’m not scared of it. 1:15pm Big Brother blocks the feeds. 2:15pm The live feeds are still blocked. 4:15pm Still blocked.. either something epic is happening or the twist has been an epic fail.. I hate the way Jordan goes on like he is the best male player in the house. It’s a long shot but i hope this new veto twist gets him on the block.If not him,Zack would be a great choice. Can i just say how grateful i am for all the updates on this site! I’m in Sweden and different time zones complicate things. This is such a great source to go to during the day, whenever i can. Thanks! Thank you C! We’re glad you love our updates and appreciate you letting us know. agree!! Im watching from Belgium and am so appreciative! Thank you! And so cool! I took a train through Belgium last September :) I wish we could have stopped to see more of it. Yes! Thank you Simon & Dawg. I was in India recently and able to keep track of all the shenanigans in the BB house because of the great work you guys do on this site. 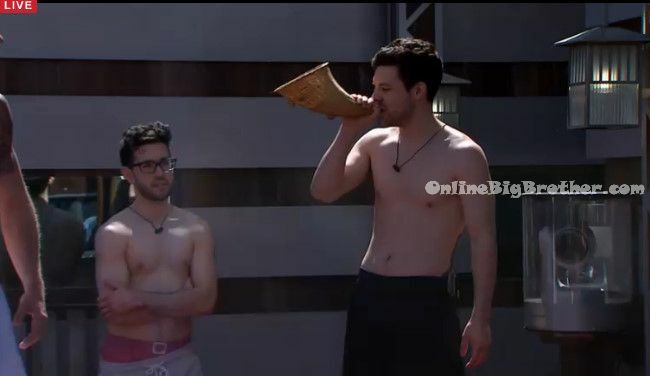 Should we all call Jocasta to come start talking in tounges to get Bruno to use the double veto on Sarah and Johnny and put Zach and Jordan up in thier place? It worked for her and Amber in that chess BoTB. Honestly, looking at everyone’s game for the past 4 weeks, if I applied for bb, I think I would’ve had a greater choice of getting in and wwinning compared to half of them. Sorry if this was posted/commented on already but….can someone clear this up. so is it a double veto where he has to replace both nominations? forced veto….where he has to use the veto on 1 nomination and replace? We haven’t found out the results of the voting yet. When the live feeds come back from the veto ceremony we should know which it was. If Big Brothers poll was anything like ours (68% for Double / 32% for Forced) then Bruno had the option to veto one, both or none of the nominations if he wanted to. Unfortunately neither Johnny nor Sarah talked to Bruno before the feeds cut. Possibly they got to him after they cut but I doubt it. Bruno’s only worried about putting up Zach Jordan or Kevin cause he needs the votes, right? So if it’s the double veto, he might take a jab and take both nominees up. If it’s a forced veto, again he could just put one of them up as a ‘pawn’ and they could still go home. Hopefully Bruno makes a move either way. I don’t understand all the hate for Jordan and Zach. They’re both playing solid games while some other houseguests aren’t playing at all. I’m just curious as to why many people on here dislike them. because no one likes to watch a predictable season of one group running the whole show. Plus they are too cocky , yet they haven’t won any comp to warrant that. Big Brother isn’t about winning comps you moron. Dr. Will never won an HOH or POV. I don’t think name calling is necassary…… god. Yes, you sound just like Jordan and Zack, calling people names. And because they’re coming across as arrogant pr1cks. Their game does seem to be working for now, but I can’t stand how cocky and annoying they have become and they think they run the whole house and in a game like BB you never really run the house. You never know what other players have up their sleeves and factor in game twists, production, and the voting public and acting so cocky and superior this early in the game is just foolish and makes you look like a douche. I can’t speak for anyone else, but I like the z/j strategy, hate both of their personalities. more than that, I really dislike production’s manipulation to make Zach the hero of the season. from the moment they listed an education major (accoding to the regina rams football roster) as pre-med (no Canadian university offers a pre-med major, only post graduate doctoral study in medicine), to the over abundant time they’ve spent extolling his virtues in every sideshow, to the golden edit z and j get… it just rubs me the wrong way. Another Name, the University of Regina does not offer a medical degree. However they do have an agreement with institutions that do. The UofR offers a stream of courses that are pre-med oriented for students heading to a medical medical/degree. So while there is not pre-med degree, there is a subset/program that students may access if accepted by the other institution. I’m a bit hazy on that last point as processes may have changed. yes, anonymous, many universities offer courses that are geared for those that wish to continue post graduate in the medical field in order to fill pre-requisites, but their major is not considered pre-med. that was my point. I would love to know the same question but my opinion people just don’t like them because they have seemed to be getting their way so far but who else are they to root for that is really playing this season except Newport, I love Sarah but she is all talk, she has no one to back her up except B, but anyone else isn’t seem to be no where near their game. Yeah Bruno and Sarah talk about doing this or that but most likely they won’t do it. wishing my late night guarded optimism was still the case, but the cynic has overpowered the optimist again. completely getting the feeling that last nights feeds were just another case of pre-instant eviction night all over again. hope i’m wrong. but I don’t see a change coming. if you can access slice (the network from last season) it still handles afterdark, and has a backdoor to get to bb on global. i’m a bit of a technological moron here, so I hope it helps. Almost six and the feeds are still blocked?! I can only pray Bruno has used the double veto on Sarah and Johnny and put Zach and Jordan up. If he has I can only imagine how insane and intense things in that house must be. That is the kind of stuff that reality television is made for. Power Of Veto Ceremony Results! Big Brother’s GRENADE was a DUD!